Published: February 8, 2019 • Modified: April 18, 2019 • by Author: Analida • Word count:769 words. • About 4 minutes to read this article. 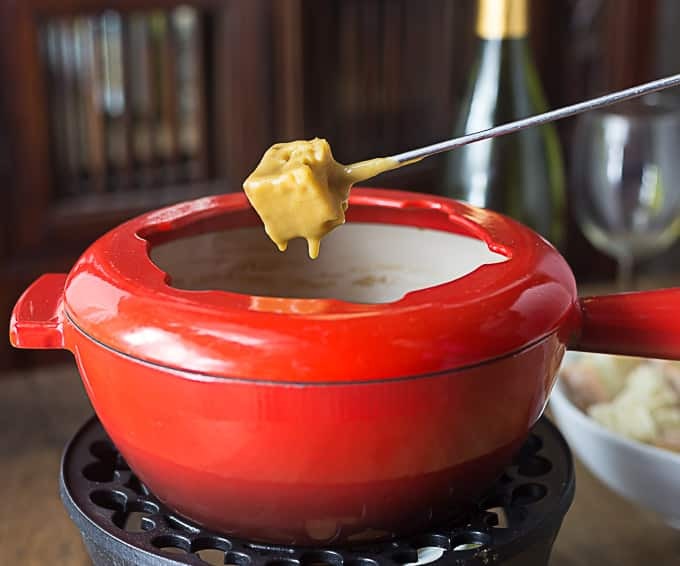 You can make this Guinness and Cheddar cheese fondue recipe with a few simple ingredients. 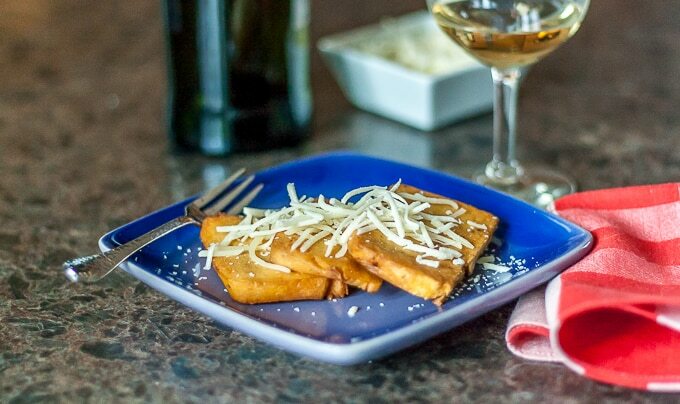 It is the perfect addition to a Friday night among friends or your next appetizer party. Warm and delicious! Guinness and Cheddar Fondue went over really well at a party!! Every year one of the guys on my floor hosts a great Christmas party. It’s a great time because he also invites other people from other departments that we don’t see on a regular basis. Everyone brings something to share. So, every year my husband and I try to bring an Ethnic Spoon recipe. This year, however, we decided to come up with a recipe just for the party. Two summers ago we were in Ireland, many of the pubs had a similar dish as part of their fare. I enjoyed it very much. It wasn’t really that hard to replicate. Fondue is one of those things that is festive and usually goes over well at a party. Another reason for choosing to make this dish: my university has a small campus in Dungarvan, Ireland. Every semester a group of professors and students descend on this quaint Irish town for a semester of Irish culture, yes, academics included! In some way shape or form, Guinness is always part of the picture, given fun times at the pubs. They do work and study hard, don’t get me wrong! Many of the attendees at the party have spent a semester in Dungarvan at least once. Guinness has certainly been around the block. According to their website, in 1909 Sir Douglas Mawson, the Australian geologist/explorer, left some Guinness behind at his base camp; it was later found in 1927. Unclear is whether the person who found it actually drank it. Today Guinness is brewed in about 49 countries and sold in almost 150 countries. Trivia: Where in the world is Guinness as popular as it is in Ireland? Nigeria! Anyhow, the Guinness cheddar fondue went over very well. Out of the corner of my eye I saw people scraping every last bit of cheesy goodness from the bottom of the pot. I am serious when I say that I almost didn’t have to wash the pot! Step 1: Gather your ingredients: cheddar cheese, flour, nutmeg, allspice, cayenne, Worcestershire sauce, butter, Dijon mustard and 14.9 oz Guinness. Pretty simple huh? Step 2: In a large mixing bowl add the flour and spices. Step 3: Stir the flour and spices to coat the cheese. Step 4: Place your fondue pot on the stove on medium heat. Add the butter and pour in the Guinness. Once the butter is melted stir in the Dijon mustard. 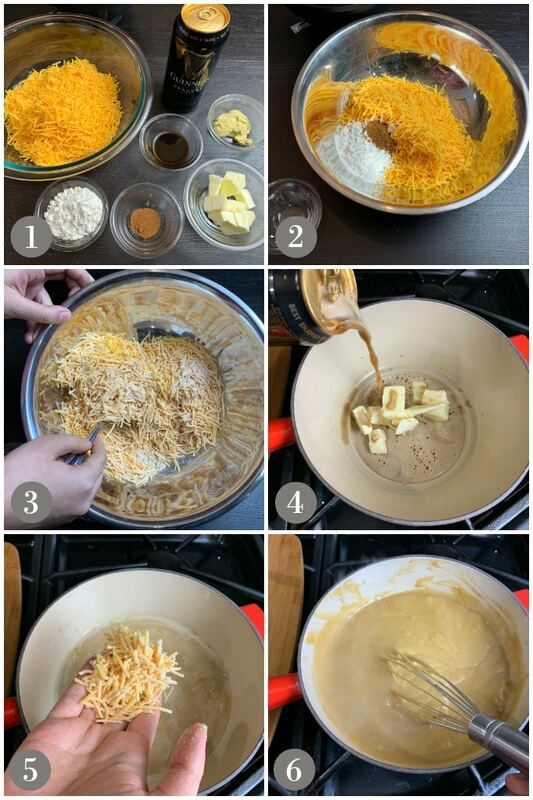 Step 5: Add the cheese slowly in 1/4 cup batches then whisk to combine until fully integrated and melted. Continue until all the cheese is added. Step 6: Continue to whisk the cheese until it is hot and bubbling. Take this to your table with the fondue stand and enjoy! How about a nice gooey cheese fondue with Guinness! This hot bubbling dish even has a little cayenne kick. Serve this as a side dish, party appetizer dip or may family has sat down and had this for dinner with a nice side salad, dip in some apple slices too! So good! In a large bowl place cheddar cheese. Add in the flour, nutmeg, allspice, and cayenne. Mix well to coat the cheese. Place your fondue pot on the stove on medium heat. Pour in the Guinness and add the butter. When the butter is melted, stir in the mustard. Slowly begin adding the cheese mixture in 1/4 cup increments stirring constantly to melt the cheese into the beer. When you have finished adding in all the cheese, add the Worcestershire and stir quickly. 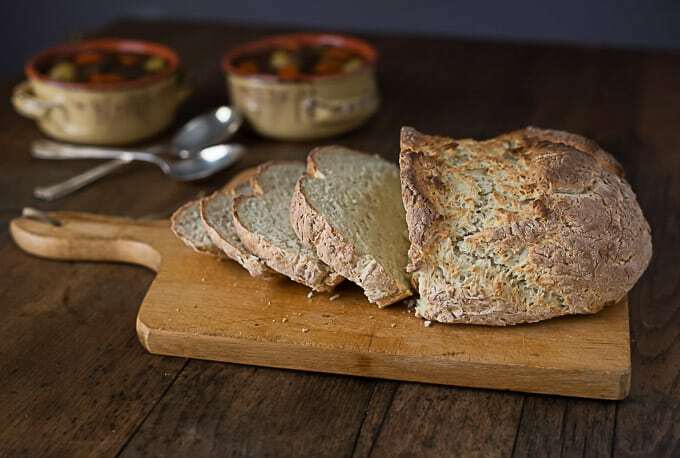 Serve with bread cubes and some sliced apples. You can even dip in some mini meatballs! So Good! Well, you out-did yourself. My hubbie who is loves Guiness and Cheddar will be in heaven with this one! LOL Kristen! I hope your husband likes it. I love fondue and had been thinking about making it since I read it’s national fondue day later in the month, apparently. This sounds like a tasty variation. Thanks Caroline! It’s really tasty. Like I said my co-workers really enjoyed it! Give it a shot! What an utterly delicious sounding fondue!! Perfect for the big game this weekend, or for a St. Patrick’s Day party! Love it! Thanks Michaela, yes, I thought it would make a great dish for the big game, and most definitely for St. Patrick’s Day!!! I think I need to get a fondue pot again. My last one I used once and it broke. ;( This looks absolutely delicious! Maybe I can make it in a double boiler????? I’ve never made it in a double boiler, so I don’t know if it will work. A small chafing dish might work. I have a couple that I received as gifts a long time ago. You could probably find an inexpensive one on Amazon or even ebay! Good luck. 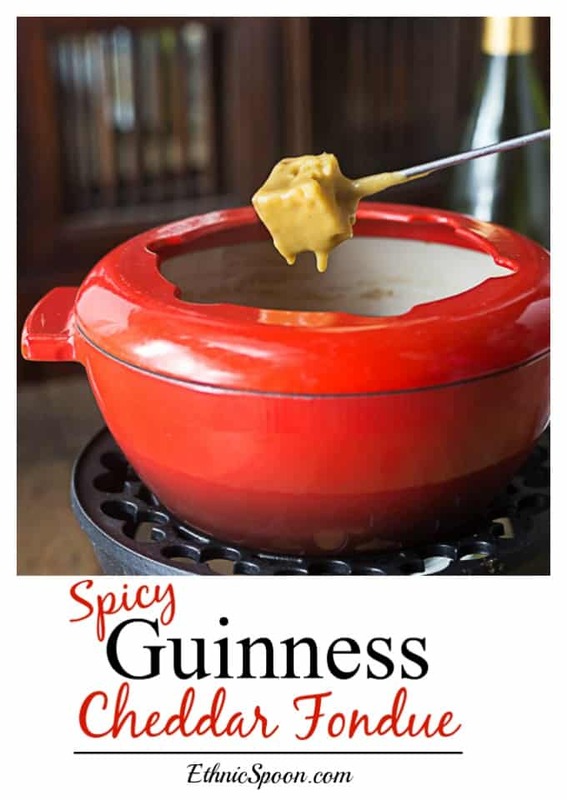 My husband loves to make fondue and he loves Guinness, so this will be a big hit at my house, we will have to try it soon, it sounds wonderful! Thanks Joy, let me know how it turns out. This sounds like a must try recipe to me! Guinness and cheese is a winning combo! Hi Michelle, yes it is! Thanks for the comment. You are welcome Dee. Yes, I think you must buy a fondue pot, just for this. There are so many other kinds of awesome fondue dishes also!!! 🙂 Thanks Lou Lou Girls you guys are always so kind with your comments. I hope to be there on Monday!!! happy weekend! It’s been too long since I’ve made fondue. Yours looks delicious and thank you for the encouragement to make some up real soon! Sure thing Renee! I love fondue, especially on a cold winter night. I love the different spices in this! I am looking forward to trying it, thanks so much for sharing 🙂 Pinned! I’ve never made fondue, but I think I need to change that! This recipe sounds SOO good! Thank you for sharing at Merry Monday! Amanda, you should. It’s a fun thing to make and enjoy with friends. I am a HUGE fan of cheese in general and fondue in particular! Any time I see it on a menu, it’s probably what I’ll be ordering. 🙂 I don’t make it at home nearly often enough and I need to change that! This looks delicious and I love the use of Guinness here. Hi Faith! Yes, you need to change that! This is a family favorite during the winter months. My daughter keeps bugging me to do a fondue, so now I will have to try yours. Looks delicious. I’ve always used wine in my fondue, but now I can’t wait to give Guinness a try! Thanks for sharing your fantastic recipe! You are welcome Claire! I hope you like it. I cannot remember the last time I had a fondue. I do remember they were fun, especially for entertaining with. This looks delicious and I know it would be a hit at a party. This is a favorite in our house and it is so easy to make! Cheese sauce… with Guinness??? Oh my goodness you’ve stolen my heart. I can’t wait to make this next time I have some friends over to share! There is nothing quite like sitting around a bubbling pot O’cheese with loved ones! 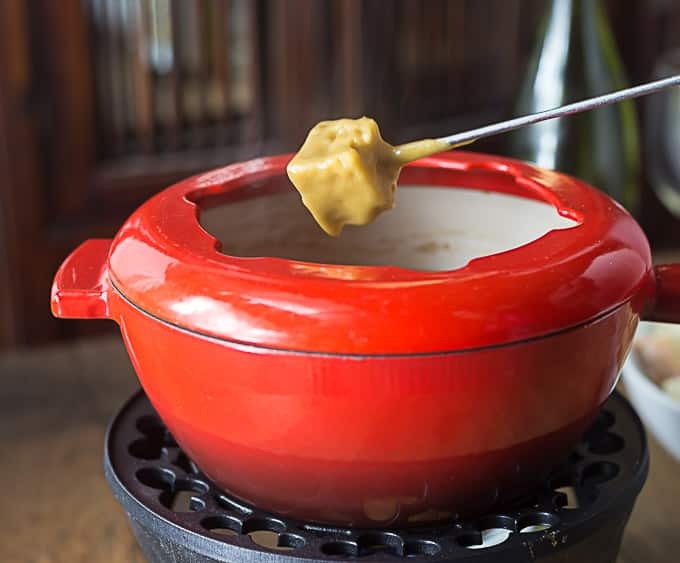 I love fondue as it’s such a great meal to enjoy with friends, I’ve never made my own though and this recipe sounds delicious. Oh, my word, Analida! Guinness in a cheesy fondue?? Sign me up!! I love fondue and Guinness and the thought of them being combined makes me do a happy dance!! This looks so delicious! This is my family’s most requested dish for Saint Patrick Day! Slainté! I will never say no to fondue!! Love the addition of Guinness in this, it must give it an amazing depth of flavour! Such simple ingredients that are easy to find make this an impromptu dish your family will love! fondue is such a fun party idea! it’s also great for a nice date night in 🙂 love that you used guiness here for flavoring. and cheddar is always a favorite in my book! Yum! This would make a tremendous date night dish or even a fun starter for a party. It really makes me want to invest in a proper fondue pot. I love that you get the creaminess from the cheddar but it’s more complex in flavor with the beer! I would eat anything you cook you know how to add flavor to a dish! However this is one that my hubby would LOVE! I can see how the spices and Guiness would add so much to the cheese. And who doesn’t like to dip into some melty cheese! This a never fail recipe and who doesn’t love a hot cheesy dish! Cheese fondue is always so tasty but love the addition of Guinness to this version! This is going on the menu for my St. Patrick’s Day party!! I have never had a cheese fondue with beer in it but I do LOVE beer and cheese soup! Would LOVE to try this! The perfect fun party food and so delicious with bread – I would totally dip some broccoli though! LOVE cheese and broccoli! I love the broccoli idea! We often cut up some apples and some precooked mini potatoes to dip also. So good! I always love fondue, but this Irish twist makes it even better! My family will love if I make this for St. Patrick’s Day! This is a great dish for company, a party or to celebrate st Patrick’s day! I love the rich, toasted taste of Guinness, I bet it’s the perfect subtle pop of flavor with the gooey cheese. Can’t wait to try this for company! The beer was a perfect addition to the cheese sauce! Made it to go with some homemade pretzels and it was a match made in heaven! I never thought to make some pretzels to have with this. That sounds fantastic for a party idea! I love a pint of business, and I love cheese fondue! So I’m pretty excited to try this recipe! While I am a huge fan of the classic Swiss Cheese fondue, you got to switch it up now and then! This would be perfect for a date night! I’m not a big fan of Guinness to drink…too heavy for me. But man, it looks divine in this fondue! What a great way to add depth and even more flavor to a fondue. Perfect for St. Patrick’s Day! OMG this looks so indulgent! What a creative fusion recipe combining fondue with guinness! Now I need to find my fondue pot! 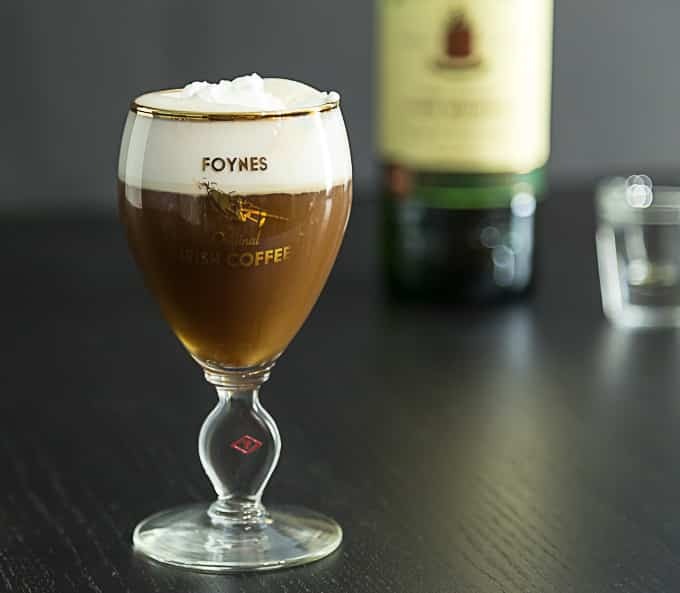 I just bought some Guinness and I’m thinking this recipe would be the perfect use for it! This fondue looks SO creamy. I neeeed to try it! Saving this for St. Patrick’s day! Love beer and cheese! Yum! And I cant even begin to explain how much dairy I’m craving in this chilly weather! Thanks so much for sharing :). Fondue looks sooo good. A perfect conversation starter during any party and great for game day. Beer cheese is the best cheese! I love everything about this and can’t wait to make it this weekend. It is the perfect gameday dip or an elegant appetizer for date nights.